4.3 out of 5 based on 36 bloggers and 11 commenters. 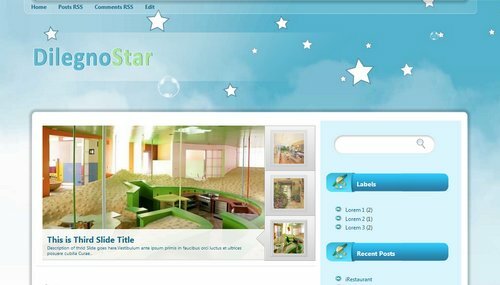 Dilegno Star is a free premium blogger template adapted from WordPress with 2 columns, right sidebar, rounded corners and slider. I love this layout, but I have a question. Are we allowed to change the header image (the Dilegno Star) with our own customizable text, or would you rather there not be any customization? @Sheepy: 1° step: Create your own logo. You may use the psd file included in this template (logo.psd). 2° Host your new logo image in any free photo hosting. @Lorena Moreno: Revisa nuestras FAQ en español. Allí encontarás instrucciones para instalar cualquier plantilla Blogger, además de respuestas a otras preguntas frecuentes. Solamente una pregunta: se puede cambiar el fondo?… de ser así, cómo lo hago?. Espero tu respuesta. muchas gracias! La imagen debe tener las siguientes dimensiones: 1500px × 842px. How do I setup the slide show ? Something weird happened to my slideshow! It’s literally all over the place! Something weird happen when I put recent comments widget. Every time the pages refresh the green background pictures from below will have a flash for a moment. How can I fix it? This template is so pretty… Can I change the slide show ?